Perfect for the office or shop. All-welded steel frame holds loads up to 250 lbs. 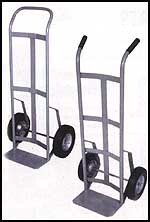 An economical hand truck that's designed for lightweight packages. 7" x 1.50" semi-pneumatic tires on plastic hub. Measures 18 3/4"W x 41 3/4"H. Toe plate measures 6 1/2" x 14".